All mammals possess an armament of enzymes capable of breaking apart various groups of molecules. These enzymes are typically named after their target. Peptidases act on peptides, lactase hones in on lactose, and so on. The enzyme-driven breakdown of molecules serves a wide variety of functions, which include the acquisition of nutrients from food, recycling of old cell parts, regulation of communication between and within cells, and detoxification of plant-derived poisons. 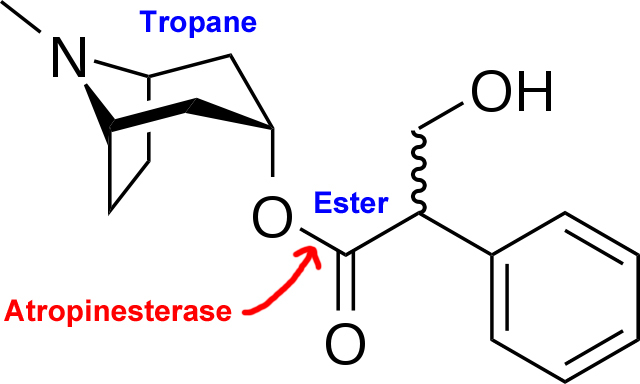 Esterases are good at taking apart esters. They accomplish this by using a water molecule to split the carbon-oxygen bond that lies at the core of an ester, resulting in the production of an acid and an alcohol. An important ester in the human body is acetylcholine, which functions as a neurotransmitter and thus enables communication throughout the nervous system. To turn off the signal created by the presence of acetylcholine, we produce an enzyme called acetylcholinesterase, which cleaves off an acetyl group (essentially acetic acid, which is found in vinegar), leaving behind inactive choline (an alcohol). We can re-attach the two to regenerate acetylcholine elsewhere or at a later point in time. 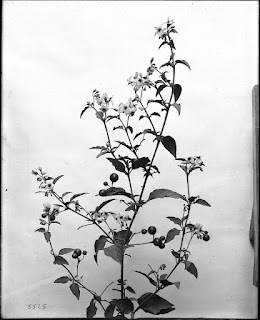 Unlike other mammals, rabbits have been observed to be capable of munching on the leaves of a plant called deadly nightshade (Atropa belladonna) without becoming dead. The plant contains a number of tropane alkaloids (tropane = a ring of seven carbon atoms fused to a second ring formed by a nitrogen atom) including atropine and scopolamine. These alkaloids, which we use as drugs in low doses, can cause a variety of nasty and deadly effects. They also happen to be esters. Further investigation of nightshade-resistant bunnies revealed the presence of relatively high concentrations of atropinesterase in their blood. This enzyme is capable of breaking apart nightshade-derived tropane alkaloid esters, resulting in their detoxification. It has been estimated that atropinesterase-producing rabbits have enough of the enzyme coursing through their veins to inactivate the same amount of atropine typically used to produce useful effects in substantially larger human beings. Interestingly, appreciable production of this enzyme is only found in rabbits (vs. people, pigs, goats, and dogs), and even then, only in some of them and seemingly at random. For example, two different studies reported that 59% and 33% of New Zealand Whites made the enzyme, so within a single strain the proportion of rabbits able to deal with deadly nightshade can vary widely. Very generally though, it appears rabbits with a fair amount of black fur tend to make lots of atropinesterase, likely reflecting a linkage between the genes encoding these traits. Atropinesterase can pose a bit of a problem for researchers using rabbits as an animal model to investigate the effects of certain drugs. In cases where rabbits are being given atropine or scopolamine (which are used to block certain actions of acetylcholine, and so are fairly widely used), results can obviously be skewed by whether or not they quickly rid themselves of these drugs. In particular, studies looking to investigate potential treatments for organophosphate poisoning can be disrupted since these poisons inhibit acetylcholinesterase and atropine is typically used to control the toxic effects of the resulting build up of acetylcholine. Incidentally, rabbits also produce an enzyme called cocainesterase, for which the scientific literature is rather scarce. Cocaine is also a tropane alkaloid. Perhaps South American bunnies can safely eat coca plants? Cauthen SE, Ellis RD, Larrison SB, Kidd MR. 1976. Resolution, purification and characterization of rabbit serum atropinesterase and cocainesterase. Biochemical Pharmacology 25(2):181-185. Harrison PK, Tattersall JE, Gosden E. 2006. 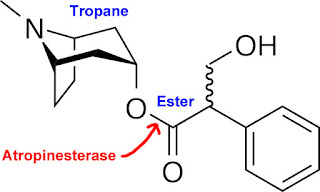 The presence of atropinesterase activity in animal plasma. Naunyn-Schmiedeberg's Archives of Pharmacology 373(3):230-236.